More than 400 engineering students made the most of the freezing weather in Edmonton on Saturday with a classic Canadian activity — tobogganing. More than 450 engineering students made the most of the freezing weather in Edmonton on Saturday with a classic Canadian activity — tobogganing. But the students from across the country didn't use traditional wooden or plastic sleds. Instead, they crafted their own, using concrete and an assortment of other supplies. The group gathered at Sunridge Ski Area to take part in the annual Great Northern Concrete Toboggan Race, an engineering competition where students create toboggans and then race downhill. Students from 20 Canadian post-secondary institutions and one U.S. school took part in the competition, which is in its 45th year, said Amanda Fremmerlid, a spokesperson for the race. 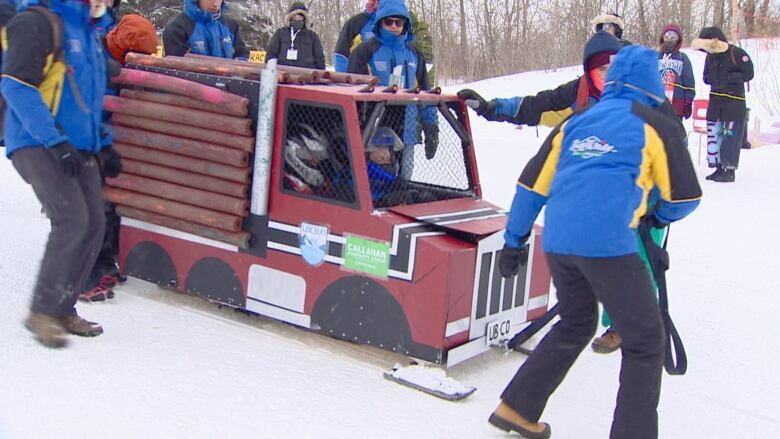 Watch: Engineering students take part in the 45th-annual Great Northern Concrete Toboggan Race. Each team had to build a five-person toboggan with a running surface made of concrete, she said, so most of the sleds were built on concrete skis. They also had to have a roll cage, steering and braking systems, and weigh less than 300 pounds. "Designing concrete is a part of our civil engineering curriculum, so we found a creative way to make it part of a student vehicle project," said Fremmerlid, who noted the winners get bragging rights. The first concrete toboggan race was in 1975, and included students from the University of Alberta, the University of Calgary, NAIT and SAIT.